Domains in hypothetical proteins in Drosophila, C. elegans and mammals. Occurs singly in some nucleoside diphosphate kinases. 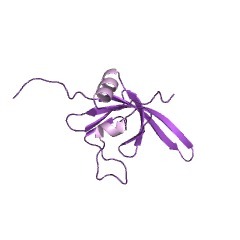 This entry represents the DM10 domain, which consists of approximately 105 residues whose function is unknown. The DM10 domain has been identified in only two types of proteins: nucleoside diphosphate kinases (which contain a single copy of the DM10 domain) and in an uncharacterised class of proteins (which contain multiple copies of DM10 domains). The nm23-H7 class of nucleoside diphosphate kinase (NDK7; IPR011410) consists of an N-terminal DM10 domain and two functional catalytic NDK domains. In Chlamydomonas, this protein (termed p40) is tightly associated with the flagellar axoneme. The DM10 domain exists in multiple copies in an uncharacterised class of proteins that includes Chlamydomonas Rib72 and mammalian Efhc1. Rib72 and Efhc1 each contain three repeated copies of the DM10 domain followed by a C-terminal domain containing two EF-hands that are predicted to bind calcium ions. Orthologous proteins are present in many other organisms that contain motile cilia including mouse, rat, Ciona, sea urchin, Leishmania, and trypanosomes. However, no obvious Rib72/Efhc1 relative has been identified in higher plants, or in the Caenorhabditis elegans genome, which encodes only one DM10 domain-containing protein. In Chlamydomonas, and possibly mammals, DM10 domain-containing proteins are tightly bound to the flagellar doublet microtubules. This suggests that DM10 domains might act as flagellar NDK regulatory modules or as units specifically involved in axonemal targeting or assembly [(PUBMED:16572395)]. DM10 domains are predicted to have the same organisation of secondary structural elements, which includes seven beta strands, with a short 3-4 residue helix after the first strand, and a more extended alpha helical region at the C terminus [(PUBMED:16572395)]. There are 4505 DM10 domains in 1893 proteins in SMART's nrdb database. Taxonomic distribution of proteins containing DM10 domain. This tree includes only several representative species. The complete taxonomic breakdown of all proteins with DM10 domain is also avaliable. Click on the protein counts, or double click on taxonomic names to display all proteins containing DM10 domain in the selected taxonomic class. This information is based on mapping of SMART genomic protein database to KEGG orthologous groups. Percentage points are related to the number of proteins with DM10 domain which could be assigned to a KEGG orthologous group, and not all proteins containing DM10 domain. Please note that proteins can be included in multiple pathways, ie. the numbers above will not always add up to 100%.